As children, Jennifer Harris and Cameron Quick were both social outcasts. They were also one another's only friend. So when Cameron disappears without warning, Jennifer thinks she's lost the only person who will ever understand her. Now in high school, Jennifer has been transformed. Known as Jenna, she's popular, happy, and dating, everything "Jennifer" couldn't be---but she still can't shake the memory of her long-lost friend. When Cameron suddenly reappears, they are both confronted with memories of their shared past and the drastically different paths their lives have taken. What happens when someone you thought was lost to you forever comes back? For sixteen-year-old Jenna, it isn't exactly a reunion full of laughter and hugs. With Cameron's return, Jenna is confronted with suppressed memories and emotions tied to her only childhood friend. He brings back a painful time in her life that she has worked hard to forget. Eight years ago, Cameron was everything to her and having him back fills a void she has always had, but his return causes Jenna to revert back to some of her old, unhealthy ways. Jenna binge eats, a habit she sought help for when she left the old, fat 'Jennifer' behind, and she has some serious negative inner dialouge. Jenna has worked hard to forget those years of loneliness and has managed to hide it all from her friends and boyfriend. Jenna feels like she needs to save her long-lost friend all over again, but doing so might mean she looses everything she has worked for. I'm not really sure how this book slipped through the cracks, but I'm so glad I found the audio version at the library. 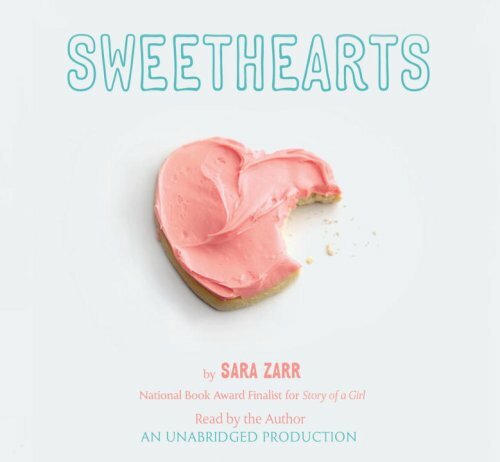 Sweethearts is a story of two childhood friends with an unbreakable bond. They shared everything together as small children. Cheers, tears, and an event that eventually sends each of them in two different directions. We learn about that unnerving event in flashbacks spread across many chapters from Jenna. Slowly, we begin to understand what lonely and unhappy children the two were. Her recollections creep up at various times, and now at 16, she is confronted with painful memories she would rather forget. The story unfolds at an unhurried pace. We aren't bombarded with answers to mounting questions. The reasons why Cameron left, why he wasn't dead after all, and what he is doing back in Salt Lake all come nice and easy. Watching Jenna confront her past and try to keep a firm foot in reality was, at times, heartbreaking. I found myself shaking my head as if to say, "That isn't true, don't say that." Jenna is a young girl that has to work at being happy. It doesn't come natural for her. She has to continue to tell herself positive things and finds herself playing the part of happy in order to appear normal to everyone. Cameron doesn't pretend at all. He's broken, he will admit that. We see that every time he disappears for a little while. This story is evidence that painful words can be more damaging than physical blows. As a reader, I am convinced that Cameron and Jenna have a strong tie, some link that can never be broken no matter the distance between them. Even if that day never happened, they would be bound in some way. You can't help thinking about some of your childhood friends and wondering what they would be like today. Wondering, who is the Cameron in my life? I was happy to learn that the author, Sara Zarr, was the voice behind the novel. Zarr spoke with a monotonous tone that conveyed Jenna's numbness to everything. When I say conveyed, I mean nailed, as in perfected. This is not a dialogue driven novel. There are no drastic changes in voice from character to character. We are inside Jenna's head for most of the story with her pessimistic thoughts and worries about everything. Zarr's pitch, tone, and almost lack of inflection kept me wrapped in this story. I need to meet her and see if she sounds like this in real life. Bottom line: Yes, this book is sad, but not depressing. Hopeful is a better word.